John Hammond is the eccentric billionaire who is the owner of Jurassic Park and founder of InGen. He has two grandchildren, Lex and Tim Murphy, who we saw in Jurassic Park and The Lost World, and a nephew called Peter Ludlow seen in The Lost World. 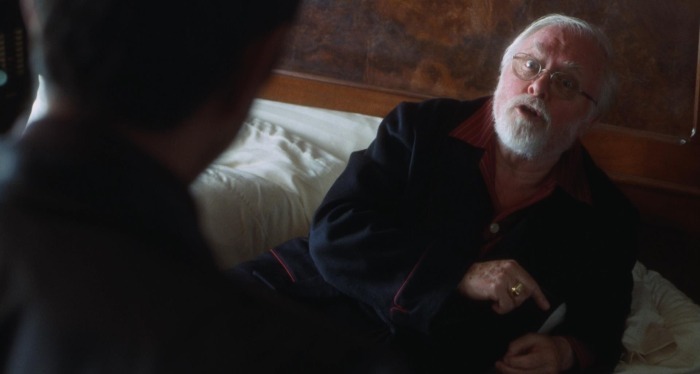 In the films, John Hammond is portrayed by Richard Attenborough. Author Michael Crichton explained that Hammond is like the “dark side of Walt Disney”. Hammond has a vastly different personality in the novels than he does in the films. In the novels, he’s a very cold, ruthless businessman whose only interest is profiting from the dinosaurs. When things start going wrong in the park, he blames everyone else for its problems and takes no responsibility himself. For most of the novel, he remains in the visitor center like in the movie. Even when his grandchildren get lost in the park, he believes the power will come back on soon enough and are in no real danger. When they regard control of the park, he puts down all the bad things that have happened as bad luck and they’ll have to try harder in the future. While he is outside walking, he is startled by the sound of a Tyrannosaurus rex‘s roar over the park’s P.A. system. He falls down a hill breaking his ankle in the process. He is unable to climb up the hill and is then killed by a group of Procompsognathus. He was 76 years old when he died. Hammond was mentioned briefly in the second novel, The Lost World, by Ian Malcolm. He considers Hammond’s large fortune and how he came to be so rich in the first place. He mentions the reasons why the park failed and the possibility of Site B. 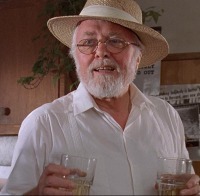 In Jurassic Park, John Hammond is a venture capitalist from Scotland and he made his money in Pettycoat Lane, England before he established parks in Kenya, Costa Rica and other places. He is portrayed as a sweet, kind old grandfather who takes responsibilities for his actions. He seems less interested in making money and a lot of those cold heartless traits were transferred over to the Gennaro character. He has a clear wish to make an theme attraction for children and families and that Jurassic Park won’t just be for the rich. Despite, the positive traits, he’s also misguided and believes that the creatures are under his control. He’s also not bothered about the moral implications of creating dinosaurs, as Ian Malcolm said, perhaps they didn’t think if they even had the right to play god. When the security system fails, he works with his staff to get the systems back online. By the end of the film, he and the other survivors leave the island via the helicopter. He realises the dangers of his creations but still sees the potential of the creatures. John Hammond makes a small appearance in The Lost World. He is seen to be a lot older and seems to be ill. He is no longer in charge of InGen and now is nephew Peter Ludlow is in charge. Hammond wants to protect Site B and keep the dinosaurs isolated from the rest of the world but his nephew has other ideas. He wants to capture many dinosaurs and bring them back to the mainland so he can build a new Jurassic Park in San Diego. Hammond then assembles a small team including Ian Malcolm, Sarah Harding, Nick Van Owen and Eddie Carr to document the creatures in their natural habitat in order to gain public support to leave the dinosaurs alone. He is then seen at the very end of The Lost World in the news report saying the dinosaurs should be left alone on Isla Sorna and says the infamous line: “life will find a way”. Dr. Alan Grant mentions John Hammond very briefly during the conference. saying he didn’t agree with his intentions. 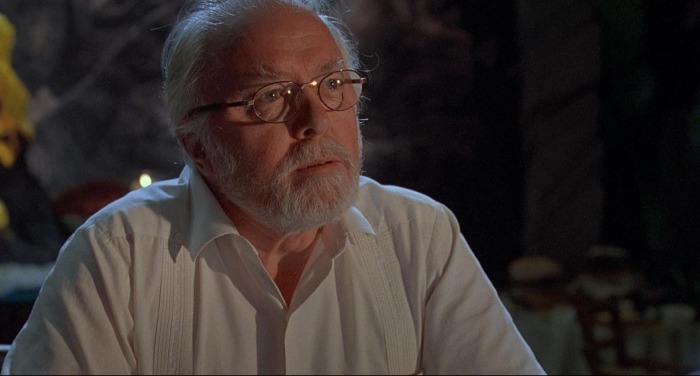 It’s unknown whether Hammond had passed away when the events in Jurassic Park 3 took place though I think this would have been mentioned if he had. In the film Jurassic World, it’s revealed that John Hammond passed away in 1997 and Simon Masrani began talks to acquire InGen after his death. be half of fans that have been following this novel since the beginning. the original cast needs to be in this film so you can pass the baton. you should not do it at all. if you want to discus this further call 716 824-9632.